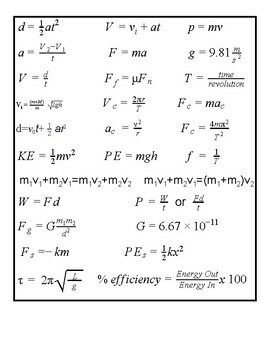 This file is just a list of simple physics equations. I give my students the entire page at the beginning of the year. They have to pick which equation to use. This is deceptively difficult because most of my students have spent years in the public school system just being given the equation. Making decisions about what to use and why is oddly challenging for them. In any respect, it's just a simple list unlike others that are out there. Note there is some intentional overlap. I left the 'c' subscript for circular in there intentionally. When students notice this, I use this as an opportunity to compare how force and acceleration are measured in a linear system compared to a circular one.